ColoradoBoulevard.net Print Edition will be published monthly, on the 2nd week of each month, covering the Greater Pasadena area (South Pasadena, San Marino, Pasadena, Altadena, Sierra Madre). We are a grass root movement (opposite to the trend of hedge fund companies gobbling print newspapers, laying off their staff and practicing “cutting and pasting”). And if you choose to subscribe or advertise, rest assured you are helping true local journalism thrive and a local institution. Your money will go to help sustain the future of our community based newspaper. Our monthly print Edition will be different from our online daily edition. Each will have differing content, sharing as the need arises. It’s about time we clean out local journalism from imposters and big money interests and make print hip again. Wafic buried the lede a bit here since it wasn’t in the headline… Congratulations though! Excited to encounter my first print copy of ColoradoBoulevard.net in the wild in Pasadena. Congratulations to Wafic and the entire enterprise for making this happen! I’ve seen lots of publications go from print to online, but rarely seen one go from being online to in print! Long term I see it as potential revenue stream. I don’t believe in decentralized web. I believe in hyper local web. The newspapers or local libraries can be backbone. Provide dead simple publishing software on subscription, coupon newsletters, take back the marketplace from facebook. The web is local news. Local news belongs to the people. thanks for what you do. I’ve documented a piece of it here and there’s some detail on the IndieWeb for Journalism wiki page which I encourage everyone to contribute to as they can. As for Ben Keith’s concern about spam, yes, Webmention can be a potential vector like trackbacks and pingbacks, but it does learn from their mistakes with better mitigation and verification. Work on the Vouch protocol/extension of Webmention continues to mitigate against these issues. I’ll also note that Akismet for WordPress works relatively well for Webmentions too, though there have still yet to be examples of Webmention spam in the wild. For publishers using WordPress, there are some excellent plugins including Webmention (which has some experimental Vouch plumbing included already) and Symantic Linkbacks which work with WordPress’s native comments. I’ll note that they’re developed and actively maintained by several, including the core maintainer for pingbacks and trackbacks in WordPress. I’m happy to help if anyone has questions. Replacing Facebook with newsletters, “Taking Back the Web”, and privacy-preserving maps. 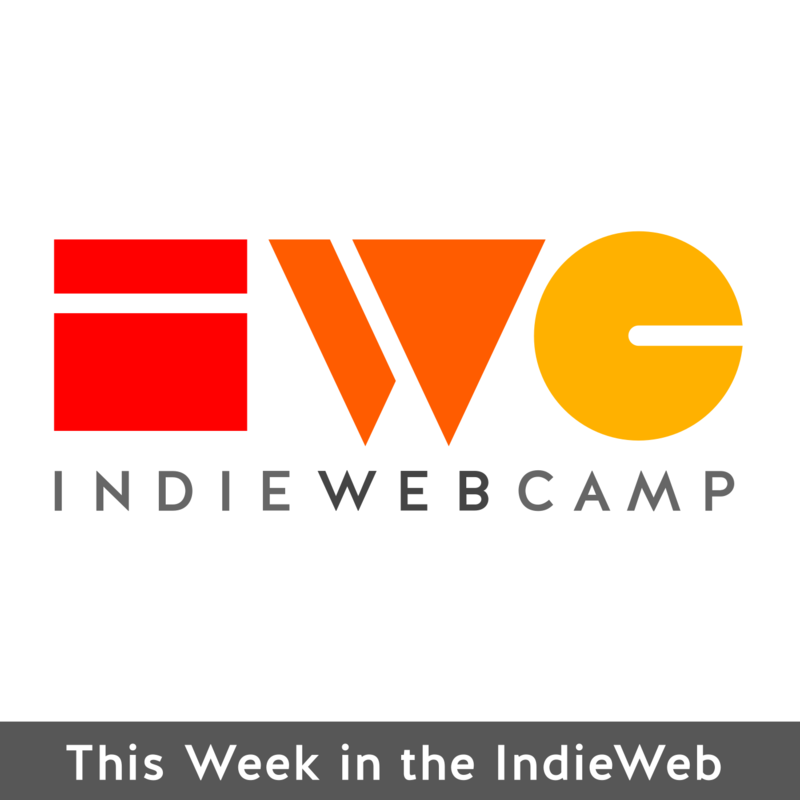 It’s the audio edition for This Week in the IndieWeb for May 26th - June 1st, 2018. Marty gives a nice mention to the note about ColoradoBoulevard.net in this week’s episode of This Week in the IndieWeb. David Shanske’s excellent Post Kinds Plugin allows one to post what they’re reading, listening to, or watching in simple IndieWeb fashion. (Examples of these on my site: read posts, listen posts, watch posts.) These posts types automatically include the appropriate microformats classes so the user doesn’t need to bother doing them manually. For a long time when replying to another’s site, bookmarking it, or even mentioning it when also using the Webmentions plugin would send the site a Webmention that would generally cause it to show up as a native comment, bookmark or mention. With an update late last year, from within the Discussion settings in WordPress, one could set toggles so that many of these webmentions could be displayed as facepiles. Other broadly unsupported post types would typically default to a simple mention. Recently David Shanske and I started a podcast, and he thought it would be useful if his site could accept listen posts and show them visually within his comments section just like these replies, bookmarks, and mentions. Thus over the past month he’s added code to the Semantic Linkbacks Plugin to add the functionality for these types of posts to properly render showing facepiles for listens, reads, and watches. Listen (or scrobble) posts can send webmentions (or notifications) to the original content potentially with the experimental listen-of microformat. In the case of scrobbles of podcasts, these webmentions could be displayed as “Listens” which would provide the canonical copy of the podcast some indicator of its popularity and actual audience. It is tremendously difficult to obtain data on the actual number of listens within most of the podcast community and typically a fraction of the number of downloads must be used as an indicator of the actual reach. Being able to display listens could potentially be a boon to the podcasting market, particularly with respect to advertising as this type of open social web functionality spreads. Similarly read posts with the read-of microformat and watches with watch-of will be accepted and show up within the comments section. Like the previous types, they can be set to display as facepiles within the user interface. From the Discussion options settings page (typically at: /wp-admin/options-discussion.php#semantic_linkbacks) one can choose the mention types one wants to have appear as facepiles within their comments section. I haven’t yet seen one for watches in the wild yet, but maybe you’ll be either the first to send or receive one? The microformats on these posts is generally considered to be experimental, but with the ~500+ users of this suite of tools as well as others who are already using them on other sites, they’ve now taken a dramatic step into the open internet and more widespread use and potential official adoption. Just yesterday, I spent a few minutes in the IndieWeb chat helping someone to laboriously delve into their mySQL databaset and find a particular snippet of data so they could manually change a received webmention from being a simple mention to being a reply so that it would display as a native comment on their website. I’ve often done this to take what sometimes seem like simple mentions and change them to replies to reveal the richer content they often contain for the broader conversation. Sadly the process is boring, laborious, and fraught with potential ways to mess things up. As of this weekend, this process is no longer necessary. One can now go to the admin interface for their comments and webmentions (found at the path /wp-admin/edit-comments.php), click on edit for the particular comment they’re changing and then scroll down to reveal a droplist interface to be able to manually change the webmention type. Samantic Linkbacks Data metabox within the comment editing interface on WordPress. One can use the dropbox to change the webmention type as well as manually update the commenter’s avatar. As another example of a use for this functionality, perhaps you’ve received a listen mention on one of your podcast episodes that has a lot of useful notes or commentary germane to your episode? Instead of hiding it as a simple listen, why not change the type to reply to allow a richer conversation around your content? After all, with a reasonable reply it will be implicit that the commenter actually listened to the episode, right? Because there is currently no functionality in WordPress for saving or caching the avatars of commenters via webmention, when users change their profile images on siloed services like Facebook, Twitter, et al. the link to their old avatars quits working and they were displaying blank spaces. This is an unfortunate form of linkrot, but one that can become more visually apparent over time. Likes and Reposts concatenated on my site now after converting them into facepiles. They still give the social “proof” and indicate the interaction, but don’t interfere in the conversation now–especially when there are hundreds of them. I’ve spent some time over a few days this month to help IndieWeb-ify my local Pasadena online newspaper ColoradoBoulevard.net. They can now send and receive webmentions and can backfeed their comments, likes, and other responses from their Facebook and Twitter accounts. They can stand to improve their support for microformats v2 and do some more work on their h-cards and other related metadata, but the editor seems thrilled with the initial results–particularly having their conversations in other areas of the internet come back to the original article. I know that individual journalists have brought their personal websites into the IndieWeb fold, but this may be one of the first online newspapers/magazines I’m aware of to begin using some of these principles and tools. With any luck and some testing, they could be one of the first journalistic enterprises to begin receiving “Read” posts of their articles via webmention! Update: read posts are working! See the first example here. I’d like to get them to a place where they can automatically syndicate to social silos and display their syndication links properly. In the end it would be really nice if their writers could own their own articles on their personal websites, syndicate them to the newspaper itself (as the rel=”canonical” link), and then both parties to be able to receive the appropriate backfeed, but this is a nice new baby step on the way to bigger and better things. I did run across one interesting identity related issue that may need some addressing within this particular space. Some of their journalists prefer not to display photos (or even names) so that they’re not easily (or as easily) identified in person for the sake of doing online reviews or other sensitive reporting assignments.